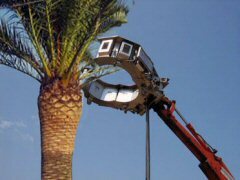 ECOPALM Ring is a device built as a CIRCULAR BAND equipped with electric MICROWAVE generators that radiate energy at ultra high frequency to the centre of the palm tree. 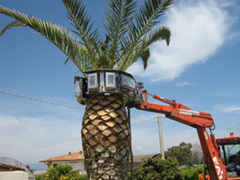 Sections of the circular band OPEN and CLOSE around the palm tree to be treated. 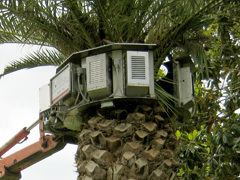 ECOPALM Ring is FAST TO INSTALL and can be mounted on a crane jib specially equipped with an electric connection cable, control panel and electric current generator (diesel). 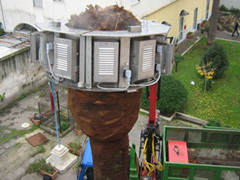 ECOPALM Ring is a mobile device EASY TO TRANSPORT ON SITE for total disinfestation of vegetating palm trees, even with tall trunks, without harming the tree, the environment or persons. The branches left on the tree after the fronds have been pruned have a high moisture rate, which encourages spreading of mould and bacteria, and emanate olfactory molecules with the typical smell that attracts the snout-beetle. The trees are hence particularly exposed to attack and settlement of the beetle. In natural conditions, it takes a few months for the palm tree to heal from pruning and for the moisture that causes mould and bacteria to dry out. The ECOPALM microwave treatment is essential to eliminate this post-pruning problem as it takes just a few minutes to sterilize the trunk surface from mould, bacteria and rot and it encourages healing of the cuts. This preventive treatment has a long-lasting effect, since it causes the bark to rapidly dry out making it difficult to penetrate and hence forming a barrier against attack and settlement of the beetle. 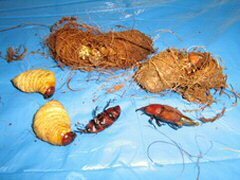 This method is particularly effective when applied the moment you notice that the palm tree has been attacked by the snout-beetle and the parasite has colonised the tree in whatever stage of its development (larva, pupa in the cocoon of the adult), it being difficult to completely eradicate the beetle at this stage using phytosanitary methods. In particular when the pupa is in its cocoon (highly protective) to prepare for metamorphosis or in the long term when the larvae settle in the tree they are difficult to reach with common parasiticidal treatments and no treatment known today is totally effective. The ECOPALM treatment aims at eradicating the snout-beetle while infestation is taking place thus safeguarding the palm tree. The microwaves penetrate the various layers of wood and where they come across the eggs, they irradiate and completely destroy the cocoons with the pupae and all the parasites guaranteeing total disinfestation of any form of pest. Use of the ECOPALM treatment method is essential in the advanced stage of attack, when the palm tree is unsaveable. The system is useful to disinfest the tree on site, eradicating the snout-beetle in whatever stage of development it is. After the ECOPALM treatment the palm tree is totally disinfested and can safely be disposed of as it is no longer hazardous waste because “full of vermin”. During the microwave treatment, there is a significant localised effect on the outer layer of the palm tree where the cocoons holding the pupae in the metamorphosis stage are situated. The energy of the microwaves totally eradicates the cocoons and the pupae are killed off and cannot develop into adults. No other known method allows achieving this result of permanently cutting off the beetle’s life cycle.